Backabit – Ramps 1.1 is here! After several long months of crafting, polishing and fine-tuning, Ramps 1.1 is finally released into the wild. We couldn’t be more excited! Once you update Ramps from the App Store, you’ll find 100 new levels containing 300 new challenges, nine achievements, two new leaderboards and six unlockable balls! We even have two new tracks from Essa… they’re riffs on his previous light world compositions and they sound amazing! We’ve heard from some players that they wanted more challenging levels to conquer. Inspired by one of our favorite Super Meat Boy design elements, we decided to create alternate dark worlds to compliment the existing light worlds. These new versions of the 100 original levels contain new challenges and gameplay mechanics we think you’ll really dig! 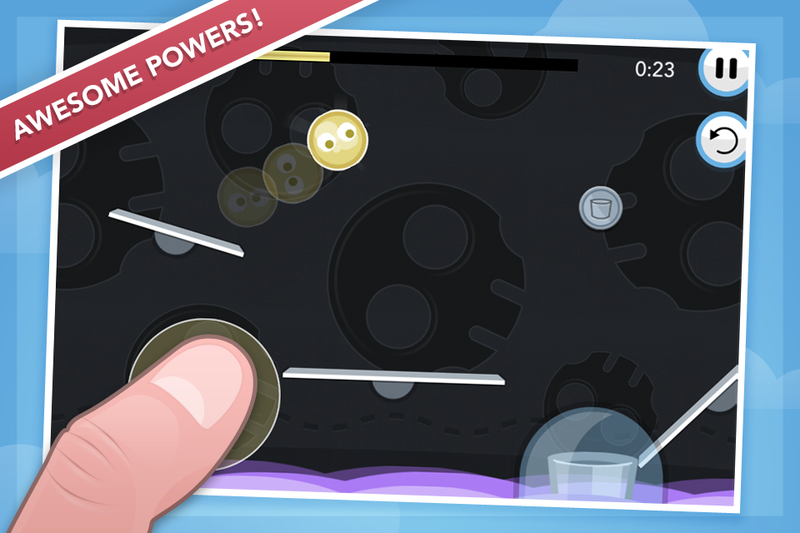 We didn’t just add new content, though—we also added Superball! Superball can grab some extra air time while becoming invulnerable to whatever baddies may stand in its way. This only lasts a short time, and can only be used once per ball, so make sure you use your Superball juice wisely. Transforming into Superball is easy: just tap and hold anywhere on the screen! Doing a major update also gave us a chance to catch up on some housekeeping. We improved the usability of several aspects of the game. For example, when you are in a scrollable level, there’s now a GO! button that travels with you as you scroll, so you never have to scroll back to the dispenser to spawn a new ball. If that ball dies, you’ll snap right back to where you left off. We also redesigned the help screens to be simpler and easier to scale. As we add even more cool stuff, it will be a lot easier for us to show you how it works, and quicker for you to get back to the action! Buried deep within Ramps, where only the most skilled players can find them (Hint: you’ve gotta complete everything), there are unlockable tributes to two of our favorite iOS games: The Incident and Wispin! The developers of these fine titles were gracious enough to give us permission to pay homage to their characters. We continue to admire and be inspired by their contributions to touch gaming. We’re so excited about our new release and we really hope you enjoy all the new content. Soon, we’ll have another big announcement for you regarding our plans for a… ahem… larger screen. For just a few short days, we are offering Ramps on sale for just $.99! Now is a fantastic time to check it out! Filed away in Design, Development and News. thanx for the update.greetings from china. Out of curiosity, when you do release the iPad update, will it be a universal upgrade to your current app or a totally separate one? Thanks for shedding any light on this that you can. I think that the new update is awsome and I cant wait until all the other updates.